(ISJM) The previously announced international conference "Reform Judaism and Its Architecture“ to be organized at the Technische Universität Braunschweig in Germany this October (2010) has been postponed. According to conference organizers at Bet Tfila – the Research Unit for Jewish Architecture in Europe at the Technische Universität logistical conflicts and financial uncertainties have forced the change. 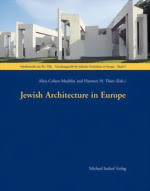 The conference is intended to be a follow-up gathering to the highly successful 2007 "Jewish Architecture in Europe," conference, the proceeding of which have just been beautifully published. New dates for the conference have not been set, but since the rescheduling will surely affect the availability of some planned speakers, those interested in participating should still contact to the organizers. In 2010, Reform Judaism all over the world celebrates the 200th anniversary of its "mother synagogue", the Jacobstempel in Seesen/Harz, consecrated in 1810 and the first reform synagogue to be built. This anniversary serves as an impetus for Bet Tfila – the Research Unit for Jewish Architecture in Europe – to research the beginnings and expansion of reform synagogue architecture from Lower Saxony in Germany to locations all over the world. - Was there a single type of a reform synagogue? - What were the mutual relations between liturgical reforms, on the one hand, and the architecture, or inner space design, on the other hand? - Viewed from a comparative perspective, what can be deduced from the architectural development of Jewish houses of worship? - What differences and similarities can be drawn from national, European and international comparisons? - Are there any specific regional elements which characterize Jewish prayer houses? In addition to considering purely architectural features, interdisciplinary approaches should also be taken into consideration. Scholars of Judaism, musicologists, historians, and liturgy experts are invited to reflect on the differences and similarities between the Jewish communities (Orthodox, Liberal, and Conservative), and to also draw comparisons to the Christian environment (Protestant, Catholic, etc. ).